suited to south Florida's growing conditions and will grow well in central and north Florida provided care is given to protect them from freezing temperatures. and wash nutrients into the root area. a silvery cast. These hairs provide some protection from insect pests and conserve moisture. For additional pictures of Staghorns , click on the underlined links below. their ease or difficulty in growing. P. alcicorne - P. vassei Easy-to-grow species with upright fertile fronds, dark green. Basal fronds turn brown naturally. Pups well. Semi-hardy to 40°F (4.4°C). Native to Madagascar and East Africa. to South America, specifically in the mountains of Bolivia and Peru. Temperatures between 70-80°F (21.1-26.6°C), low of 60°F (15.5°C). Requires low light. to grow. Produces large numbers of "pups," eventually forming a very large plant. Dark green color.Hardy to temperatures of 25-30°F (1.1°C) for short periods. Many varieties are available. Native to Australia and New Guinea. P. elephantotis (P. angolense) Moderately difficult. Thrives in warm temperatures of 80-90°F (26.6-32.2°C), low of 60°F (15.5°C). Produces large unbranched foliar fronds, dark green. Basal fronds brown in the winter. Large fern. Native to dry forests of tropical Africa. P. grande Difficult to grow. Likes high humidity but is easily over-watered. Young plants produce only basal fronds. Foliar fronds reclining, light green in color. Does not pup. Tender below 60°F (15.5°C). A large fern, prized by collectors. Native to Philippines. P. hillii Easy to grow with semi-erect dark green foliar fronds. Produces pups. Semi-hardy to 40°F (4.4°C). Several varieties are available. Native to Australia and New Guinea. P. madagascariense Interesting, small Platycerium, from Madagascar. 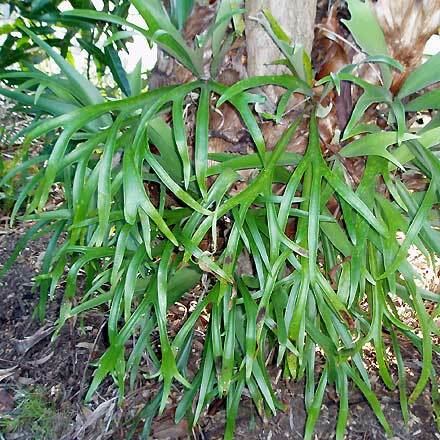 It is essentially a twig epiphyte, and is inhabited by ants, which live in the gaps created by the waffled shield fronds. if an insect eats the bud, the plant will die. The veins are raised. Ants in habitat inhabit this species, and this means it likes good fertility and the substrate should be somewhat acidic. P. superbum Difficult to grow. Very similar in appearance to P. grande when young. Easily over-watered. Large reclining foliar fronds light green in color. Does not pup. Hardy to 30°F (1.1°C) for short periods, although prolonged cold temperatures not tolerated. Prized by collectors. Native to Australia. P. veitchii A common and easy-to-grow species with erect, silvery foliar fronds. Produces pups. Semi-hardy to temperatures of 25-30°F (1.1°C) and tolerant of light frost. A semi-desert species native to Australia that requires a lot of light. P. wandae Difficult to grow species. High humidity, easily over-watered. Temperatures between 80-90°F (26.6-32.2°C), lows of 60°F (15.5°C). Possibly largest Platycerium. Native to New Guinea. will eventually emerge from the back and sides of the basket and completely cover it. it will quickly recover, whereas an over-watered fern will rot and die. Generally, water once a week during dry, hot times of the year, and less during winter and rainy seasons. Older plants, those with spongy layers of old shield fronds, tolerate drought better than less mature plants. a year of controlled-release fertilizer. 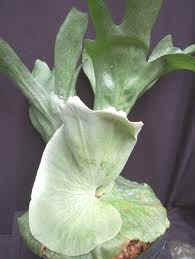 Most staghorn ferns are considered tender or semi-tender to cold and will not tolerate cold temperatures. 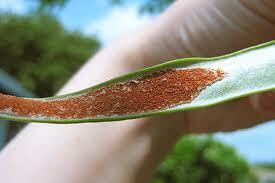 There are exceptions, such as P. bifurcatum and P. veitchii, which can withstand temperatures as low as 25°F (1.1°C). South Florida growers will have relatively few occasions when cold protection is needed. Most staghorns grown outdoors are usually in protected, naturally warmer microclimates such as under tree canopy. However, central and north Florida growers should be prepared to bring ferns into a heated garage, greenhouse or home when extremely cold temperatures are predicted. Propagating staghorn ferns from spores is slow and difficult and is not practical for most gardeners. Pups (with their root systems) can be carefully removed from large ferns and re-established. Wrap the roots in damp sphagnum and then tie the root ball to a mount. Eventually the sterile frond will expand and grip the mount. generally effective when used as directed. Food and Agricultural Sciences, University of Florida. Original publication date June 1990. Reviewed October 2003; Revised July, 2007. Visit the EDIS Web Site at http://edis.ifas.ufl.edu. Sydney Park Brown, Associate Professor and Extension Specialist, Environmental Horticulture Department, Florida Cooperative Extension Service, Institute of Food and Agricultural Sciences, University of Florida, Gainesville FL 32611. Commissioners Cooperating. Millie Ferrer, Interim Dean.